When the book starts, Elizabeth is fresh out of the transport that took her to the planet. She meets Murphy, her new supervisor, and during the few minutes that their first interaction lasts, a certain attraction forms between them. The next thing they know, though, is that Elizabeth’s transport crashed killing everyone in it, so all this time she’s been Murphy’s new ghost. This book had a wonderful premise that promised angst and perhaps even a clever, surprising resolution. Unfortunately, the execution was all wrong. Here’s a list of things that happen to Elizabeth in the first chapter: 1. She moves to a new planet; 2. She dies; 3. She meets a talk, dark, stranger named Murphy (okay, not really a stranger since he’s her new boss); 4. She feels an immediate connection to this man (or so the text would like us to think); 5. She discovers she died and that the new Elizabeth is Murphy’s new alien-ghost (even if it’s been established that ghosts only take on the form of a loved one, but hey, how else are we supposed to figure out that these two belong together? ); 6. Suddenly no one speaks to her, because that’s how humans deal with the aliens. I don’t have an issue with any of the things I just listed. There’s angst, impossible love, great conflict, and the promise of intense emotion. What’s not to love, right? Except that she gets over all the shocking revelations and life-changing events in about one day. At this point I was somewhat disappointed and my suspension of disbelief started wavering, but I kept reading because I remained intrigued. A few more chapters into the novel, some of the mysteries and workings of the world started unfolding. It looks like the planet needs humans to develop some type of symbiotic relationship with them, and appearing as loved ones is their misguided attempt at guaranteeing their acceptance. The planet also changes to resemble Earth, so it’s a desperate transformation to please the humans. This is a disturbing take on colonization; one in which the natives welcome the invasion and do everything in their power to convince the settlers to stay because they need them. I stopped reading halfway through the book, so I’m not sure if this is exactly what happens, but what I read until that point was enough to make me want to stop. I didn’t, though. And then I got to the part where the hero is forced to seduce and get the heroine pregnant or else! And that was it for me. The romance was already weak, and I wasn’t emotionally invested in the characters, as a result, a revelation that should have been terrifying, became equal parts ridiculous and infuriating. It’s incredibly disappointing when a book that shows so much promise and potential thoroughly fails to deliver. Perhaps I was a victim of my own enthusiasm, but the biggest offenders were the uneven world-building with its strange message, the inconsistent characterization, the bad plot developments, and the weak romance. *Are they still considered aliens even when they are the local species? 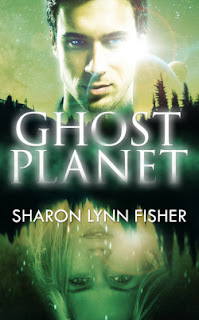 Psychologist Elizabeth Cole prepared for the worst when she accepted a job on a newly discovered world—a world where every colonist is tethered to an alien who manifests in the form of a dead loved one. But she never expected she'd struggle with the requirement to shun these "ghosts." She never expected to be so attracted to the charming Irishman assigned as her supervisor. And she certainly never expected to discover she died in a transport crash en route to the planet. Tor Science Fiction. October 30, 2013. I wound up disappointed with this one as well. Really enjoyed the setup and first half and then it just sort of failed. The idea was so, so good! I'm sorry it didn't work, because it could have been a keeper. Oh man, this is in my TBR as I love science fiction romance but seducing to get heroine pregnant...? So not my cup of tea, darn it. Love your blog! Have you read Rachel Bach's Paradox books? It's a trilogy, so you have to read all 3 to get the whole romance and story arc, but they are very good. They read like a whole book split in 3, so it's a bit of a commitment, but I highly recommend them, especially if you like SFF romance. They are way better than this one ;-) Here is a link for more info if you're interested. Hi Brie! Ooo, sounds great! And I haven't so I'm definitely going to check them out. Thanks! Darn you, Brie! As an author and editor, I don't have time to read as much as I like but I checked out your link and snagged the first book and am hooked. Grr. Seriously, though, thanks. I love getting a rec on a good series/story. Oh, yay! I'm so happy ;-) If you like the first book, then you're all set, because books 2 and 3 are way better. And since you're already tempted, I also recommend Ghost in the Machine. It's a cyberpunk novella (with a strong romance and a HEA), so you won't need to invest so much time reading it, and it's awesome. I reviewed it here and here is the Goodreads link. Also, comments on older posts are sent directly to moderation, because the spam was getting out of hand, so that's why you're comments aren't showing. But once I get the notification, I fish them out, so don't worry if they don't show.